A compressed spring that obeys Hooke's law has a potential energy of 18 j . 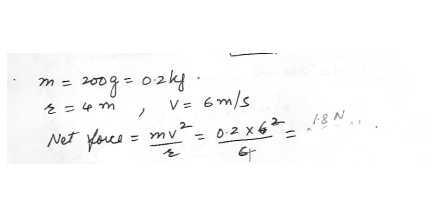 If the spring constant of the spring is 4 N/cm , find the distance by which the spring is compressed . 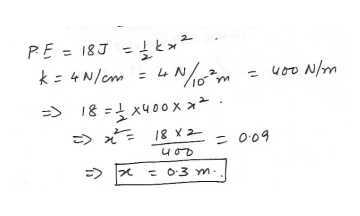 A 1.20 kg box slides down a rough incline plane from a height h of 1.75 m . The box had a speed of 2.33 m/s at the top and a speed of 1.90 m/s at the bottom . 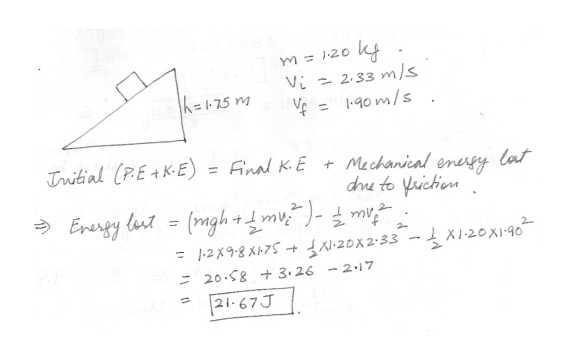 Calculate the mechanical energy lost due to friction (as heat , etc.). 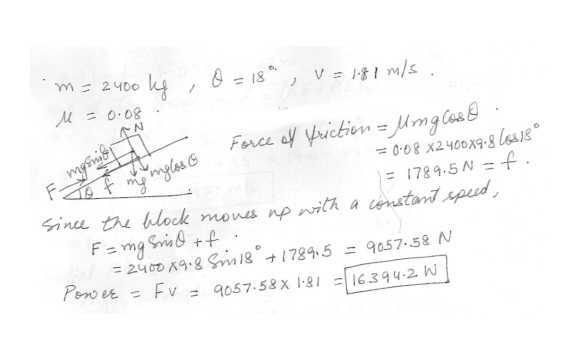 A 2400 kg block of granite is pulled up an incline that has an angle of inclination theta = 18 degree with a constant speed of 1.81 m/s by a steam which ( see the figure as shown in "click here"). The coefficient of the kinetic friction between the block and the incline is 0.08. 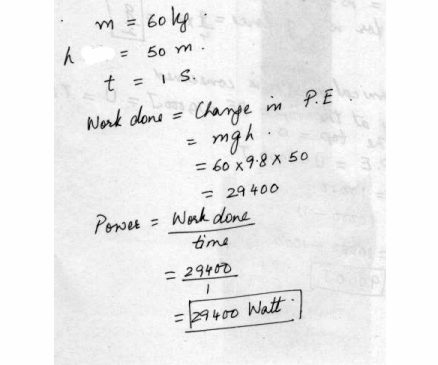 How much power must be supplied by the winch ? A 0.50- kg block slides along a small track with elevated ends and a flat central part . The flat part has a length L = 1.26 m . The curved portion of the track are frictionless , but for the flat part the coefficient of the kinetic energy is 0.188 . The block is released from rest from a height h = 71 cm on the left curved portion of the track . 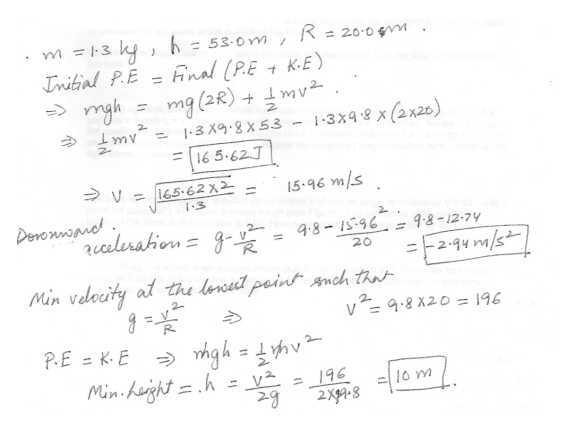 Calculate the maximum height reached by the block on the right curved portion of the track . A small block of mass m = 1.3 kg slides , without friction , along the loop-the-loop track shown . 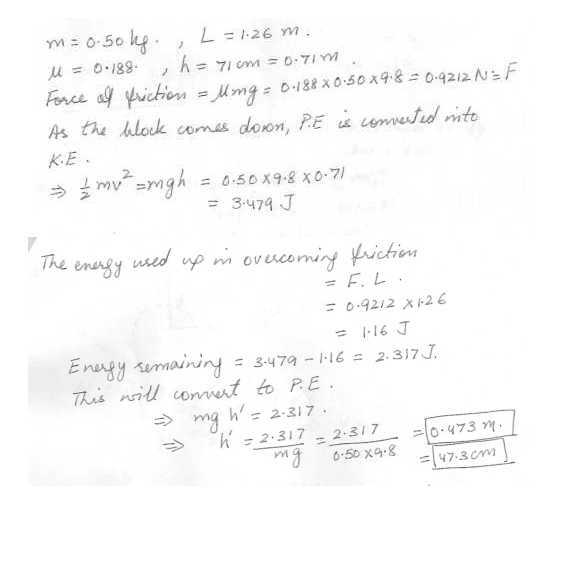 The block starts from the point P a distance h = 53.0 m above the bottom of the loop of radius R = 20.0 m . What is the kinetic energy of the mass at the point A on the loop ? 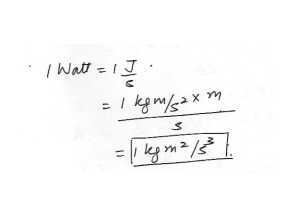 What is the downward acceleration of the mass at the point A of the loop? 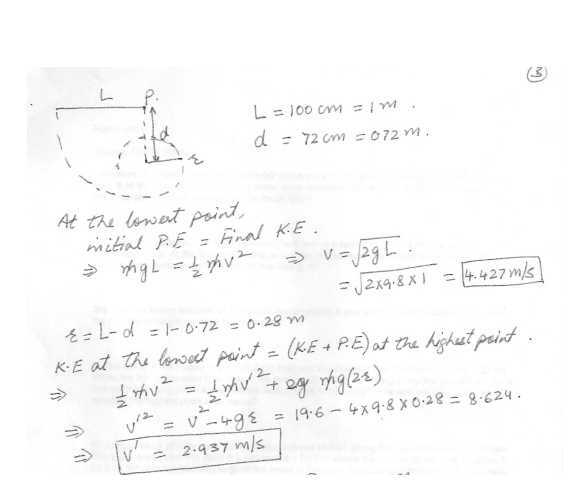 what is the minimum height h for which the block will reach point A on the loop without leaving the track? The string in the Figure is L = 100.0 cm long and the distance d to the fixed peg P is 72.0 cm . when the ball is released from rest in the position shown , It will swing along the dashed arc . How fast will it be going when it reaches the highest point in its swing ? How fast will it be going when it reaches the lowest point in its swing ? 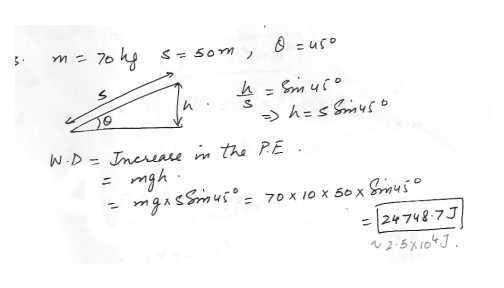 A block of mass m = 6.7 kg is released from rest at a height of H = 3.0 on a curved frictionless ramp. At the foot of the ramp is a spring whose spring constant is k = 372.0 N/m. 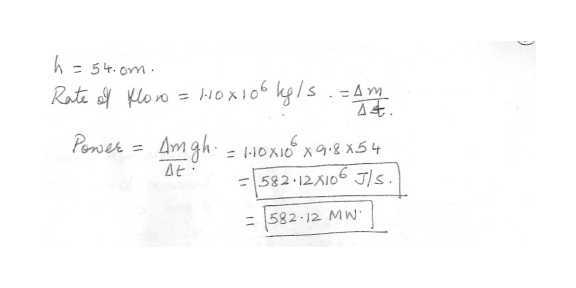 What is the maximum compression of the spring , x ? After the spring reaches its maximum compression , it pushes the block backwards . 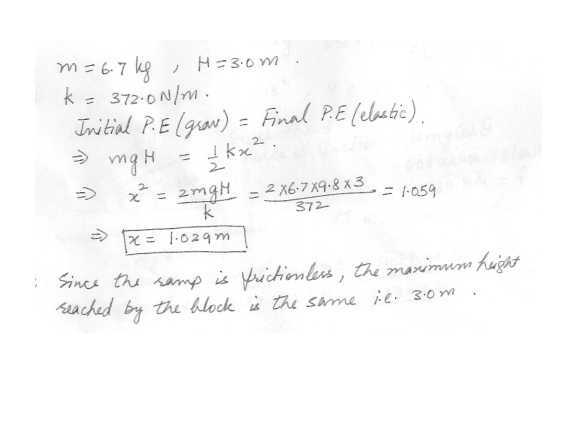 What is the maximum height reached by the block ? Water flows over a water fall which is 54.0 m high at an average rate of 1.10 E+6 kg/s . If all the potential energy of the water were converted into electric energy , how much electrical power could be produced by these falls ? A 60kg skydiver moving at terminal speed falls 50m in 1 sec. What power is the skydiver expending in air? A person dives from atop a flagpole into a swimming pool below. 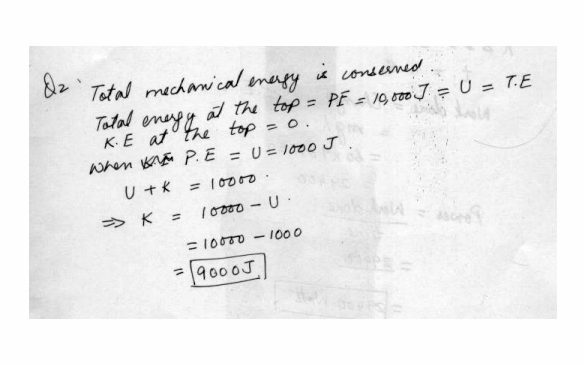 His potential energy at the top is 10,000J. 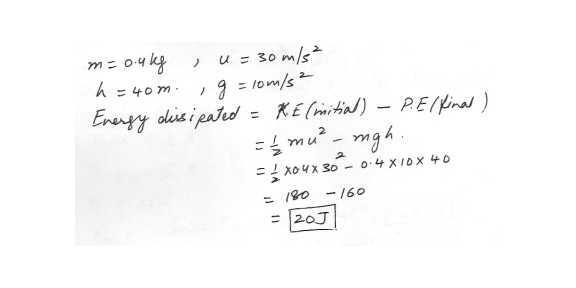 What is his kinetic energy when his potential energy reduces to 1000J? Displaying 586-599 of 599 results.